If you’re designing a streamlined, modern bathroom then the GROHE Eurostyle wall-mounted two-hole basin mixer is perfect to complete the look. Its smooth body and high quality chrome finish makes it easy to clean and the metal lever is instinctive to use. Easy and instinctive to use, it is ideal for family bathrooms and is packed with GROHE technology. A GROHE AquaGuide mousseur lets you adjust water flow direction to suit your basin. Our SilkMove cartridges use state-of-the-art ceramic discs to create a smooth lever action so you can effortlessly control the flow and temperature of water. Its EcoJoy technology reduces water consumption by up to 50% without reducing flow rate. The gleaming coating of scratch resistant StarLight chrome is easy to clean and has a sparkle that lasts for years. With a projection of 200mm from the wall, this bathroom mixer will integrate seamlessly into any clean, modern scheme. 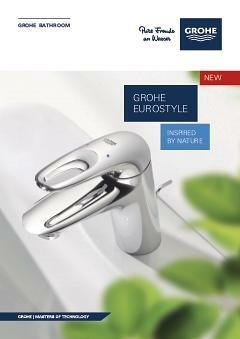 Use with GROHE concealed body 23571000. As part of the popular and versatile Eurostyle range, this mixer combines with other products in the collection for a complete bathroom solution.